There are people who run and people who think that runners are crazy! Which category do you fit into? I fall into the runner category and am often asked how I started running and joined this athletic crew. Well, let me tell you…it all started in 1992 when I began junior high as a 6th grader. On the first day of school, my mom sent me with a bag of gym clothes and told me that I was joining the Cross Country team. Cross Country??? What the heck was that? I was certainly an active child, on the gymnastics team and at practice a few days a week, but had never even thought about running. 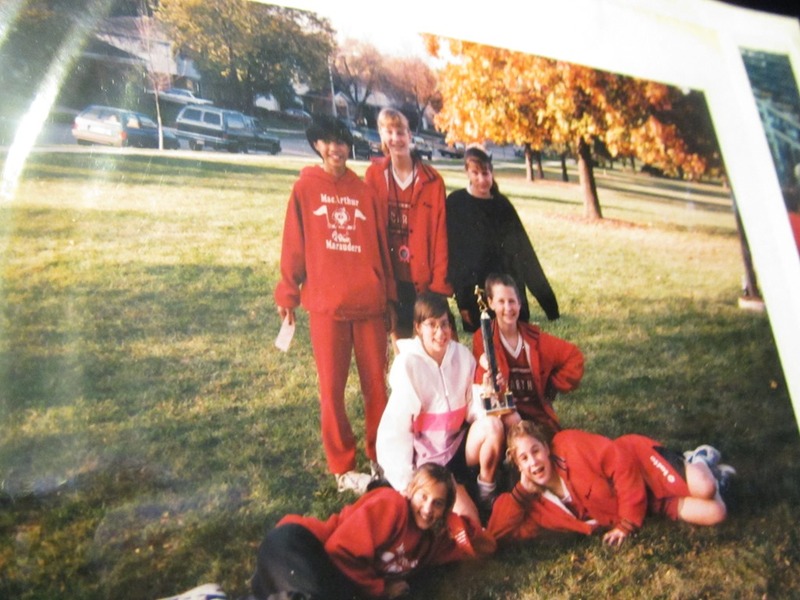 When I went to practice that first week, it seemed that a lot of other kids were in the same boat…on the Cross Country team for no other reason than because their parents told them so. Some of the friends I met running that week are still my friends today. By 7th grade, the field had thinned out. Most of my friends had found other sports that interested them and were no longer running Cross Country. For me, this was an exciting year because my times got faster, and I even secured myself a spot on the state team. Although I was the 7th runner whose time did not count towards the team standings, the weekend at state was a memorable one. Between trying to beat the boy’s team in mortal combat and climbing up the large muddy hill in the middle of the state course on hands a feet, it was a cool weekend for a young. emerging athlete. In 7th grade, I returned to the Pom Squad and made the volleyball team. I also joined the summer running group with a small group of boys and girls from the Cross Country team. But by 8th grade, I had quit gymnastics which drastically decreased my activity levels. My body changed, I put on weight, and lost some of my running speed. Along with Poms and volleyball, I ran Cross Country and track. I didn’t make any state teams and track/speed running was never my strength. I found these pictures below in my junior high scrap book. Such a funny walk down memory lane! I must also admit that I was not the most gracious of runners during this time. I had the most wonderful and supportive parents who were at every meet cheering me on to the finish line, yet when I saw them, I made faces and tried to hide from their photos. I have since apologized numerous times and make a point to smile for photos, waving and thanking all of my family and friends who support my running habit! In preparation for high school, I participated in a volleyball feeder camp and had plans to join the soccer team. But things didn’t work out as I had planned. A few weeks before the first day of high school freshman year, I broke my leg, had surgery, and spent the next few months in a cast and on crutches. I didn’t get to play on the freshman volleyball team and by sophomore year spent more time on the bench than on the court. Disappointed, I decided after my sophomore season that I would spend the fall running Cross Country instead of sitting on the bench. So junior year, I joined the Cross Country team with the goal of staying in shape for soccer season and getting a gym waiver. The majority of the team was fast freshman, but that didn’t bother me. I attended all of the practices, except for the first day of school which was also my 16th birthday where instead I went to take my driver’s test, and ran every invitational to the best of my ability. I ran again my senior year making friends with some of the younger girls and runners on the guys team. By the time, I graduated high school and left for college, running was just a fond memory in my past. I dove into college full speed ahead managing to easily gain the dreaded Freshman 15. Over the next 3 years, I had an inconsistent relationship with running. It wasn’t until my senior year, that I began to exercise regularly with two of my close friends. It was also during second semester senior year, that I tried my first yoga class. Fast forward though 3 years of grad school, where I used running as my outlet for stress relief and fitness. By the time I graduated in 2006, I was a regular runner easily completing 4-6 mile runs. When I took my first job in Memphis, I loved running along the river a few blocks from my apartment. I never really thought much about racing and if you had asked me if I was interested in completing long distances, I would have laughed in your face. It wasn’t until 2007, inspired by others I knew running long distance races that I ran my first half marathon. I trained all by myself in Tennessee running loops around the short river path in preparation for the St. Louis half marathon with my friend Kelley and her fabulous father. They taught me the ropes of distance running, and we all finished together around 2:06. I shared more of my half marathon history in THIS POST, but after this race, I was immediately ready for my next one. I signed up for the St. Jude Half Marathon in Memphis for December 2007, but was unable to participate because of a broken toe. Instead I was cheering on the runners and thinking ahead to my next race, which ended up being the St. Jude half marathon in 2008. What made this race even more exciting was that my friend flew down from Chicago to run with me! Note: We will both be running the Chicago marathon this year (her first marathon)! To date, this is my half marathon PR at 1:50:24, shocking myself at the finish line with a mile average of 8:26. This is the time that I am planning to beat this year as written on my 2013 Bucket List! When I moved back to Chicago in 2009, I was excited to sign up for some local races. I ran the Soldier Field 10 Miler Memorial Day weekend. Then, the Chicago Half Marathon in September 2009. It was fun to be running in my home town with plenty of people to run with and cheer us on! On a cold morning in December, my brother, Mom, and I did the Rudolf Ramble 8k to round out an active year. 2010 brought with it my first and second sprint triathlons and weekends spent cross training on my new bike. With my main focus on triathlon training, I ran some shorter runs including the Lincoln Park Zoo 10k and Hot Chocolate 15k. At the end of 2010, Luv What You Do was born, which allowed me to start sharing my love of running and race stories with you. 2011 was my most successful racing year to date. I signed up for my first marathon and finished two more triathlons, including my first Olympic Distance Triathlon. I ran the Shamrock Shuffle 8k, the Pathways 5k, and finished my first 20 Miler in preparation for the Chicago Marathon. In October, I ran my first marathon!!! In 2012, I focused on running for fun! I returned to Soldier Field, ran some local races, and made two attempts at a half marathon PR falling just shy of breaking through the 1:50 barrier last September. The year ahead looks to be an exciting and active one! I am already signed up for 4 running races, including the Chicago Marathon and 1 triathlon. I look forward to continuing to write my history of running for MANY years to come! It was perfect for a run! I love finishing an 8k with 33,000 of my new best friends…ha ha! It was such a fun trip down memory lane! 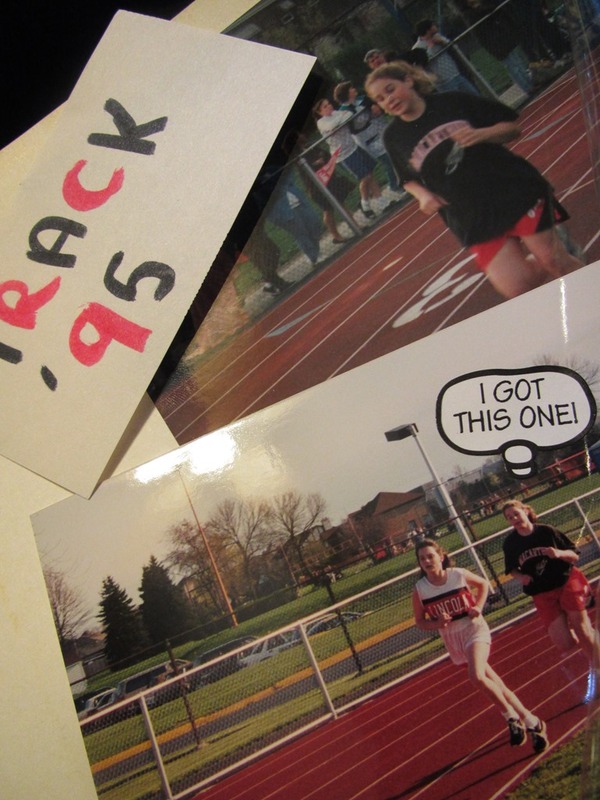 I love the flashback photos and reading about your running history- thanks for sharing! I hope your race went well this morning! It was really fun and WAY faster than I expected. Finished with an awesome breakfast, I was one happy girl : ) It was a fun flashback to write and those old pictures always make me smile! What a fun post. I got into the running game late, so I loved seeing your trip down memory lane 🙂 I would have to kill myself to run a 1:50!! That’s an amazing PR. Why thank you! I’m really hoping to break through that this year but I have a lot more training to do first. I’m glad you liked the pictures! Good Luck today!! Well, you’re probably finished now, so I hope it went really well!I love this timeline of you.. such a neat thing 🙂 and um.. 1:50 is AHHHMAZING!! Way to go! I will be happy if I ever ever get even close to that! The race went wonderful and all in all it was a really fun weekend. I like doing one big race each year and running through Chicago is always so cool! Love the recap! Hope your race went well!! Thanks! This was one of my fave posts to write so I’m so happy to year that you enjoyed it! Those photos are amazing! Hope your race went well! I thought the Shamrock Shuffle was supposed to be on St. Patrick’s Day? You’d think…right? It used to be in March but the weather was awful…cold, snow, ice, etc so ~2 years ago they moved it to April…much better! That is one of the strangest things…I don’t think my hs and college friends would believe that I do triathlons if I didn’t tell them. Looking back through my junior high scrap books was epic. I was laughing at every page…the pictures…the captions…priceless! 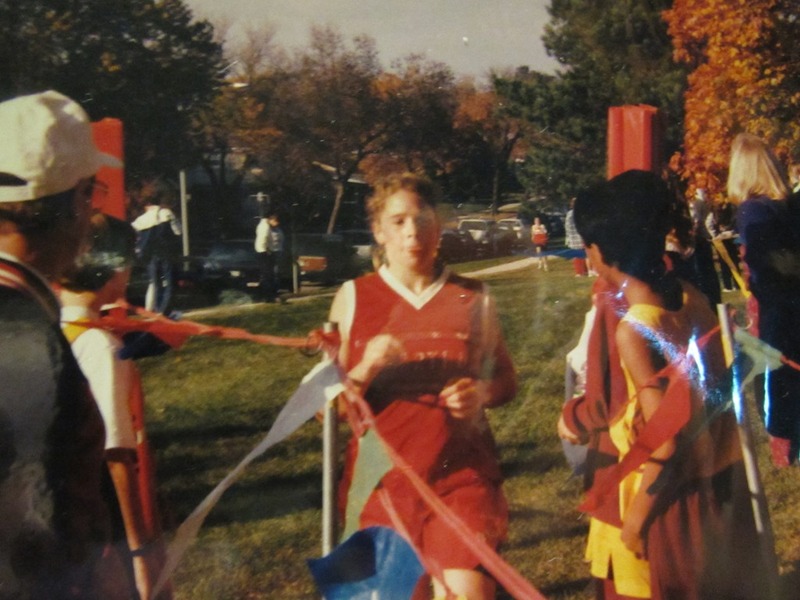 Your love of running is contagious in this post, and the old photos are great. I love hearing your back story. Thank you!! I was so happy to see that I had pictures to support the story. The color always adds a little something. Please do! I would love to hear it!